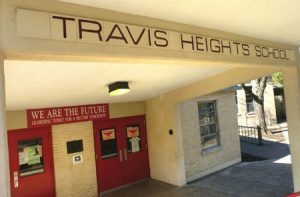 Interested in learning about all Travis Heights has to offer? Come on a tour! Once you decide on a date, just show up. You MUST have your driver’s license so as to check in with the office. (This is an AISD policy for security purposes.) When you arrive, ring the buzzer at the front door. The camera will either see you and buzz you in or ask the purpose of your visit. Just say, “I’m touring the campus.” Our wonderful office staff will be expecting you. Then proceed all the way down the hall to the office (straight ahead on the left) where they will help you with checking in as a visitor. Plan on attending an hour-long visit. (The first 20-minutes is an information session and then the tour takes 30 minutes or so, leaving time for Q&A along the way).